Ricky Gervais is the co-director and co-writer of several hit British comedy series, like The Office or Extras. Ricky Gervais is a controversial English comedian born in Whitley, Berkshire, in 1961, mostly famous for co-directing and co-writing the hit series The Office, in 2001, where he also played the lead character, David Brent. After two six-episode series, the Office gained worldwide mainstream recognition, been remade in various countries such as the United States, France, Germany, Brazil and Sweden. The show would be the first British comedy ever to win a Golden Globe, in 2003, and Ricky Gervais was also awarded the Golden Globe for Best Actor in a Television Series: Comedy or Musical, for his portrayal of David Brent on the show. Ricky Gervais started his career in the music business, trying to launch a career as a pop-star through the 80s. He would then turn to comedy and radio and in 2000 he would be given a talk show with Channel 4, entitled Meet Ricky Gervais. A year later he would achieve great success and fame with the TV series The Office, followed by another hit TV show, Extras, in 2005, again co-written and co-directed with his friend Stephen Merchant. He would later feature in Hollywood films such as Ghost Town, The Invention of Lying and Muppets: Most Wanted. He also created and starred, along with Stephen Merchant and Karl Pilkington, the most downloaded podcast in the world, the Ricky Gervais Show. The podcast appeared in the 2007 Guinness World Records book as the world's most downloaded podcast, having been downloaded over 300 million times, as of March 2011. 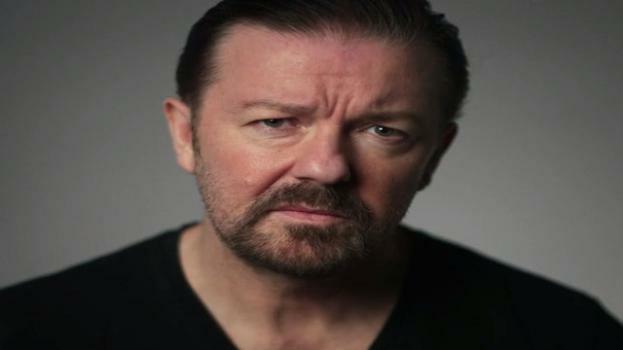 Ricky Gervais has also sold-out several stand-up comedy tours and wrote the best-selling book series, Flanimals. Recently he has hosted the Golden Globe Awards in 2010, 2011 and 2012, creating controversy with his dark and sometimes offensive humor. Ricky Gervais has won a total of seven BAFTA Awards, three Golden Globes, two Emmys, five British Comedy Awards and the 2006 Rose d'Or. In 2010, he was named on the Time 100 list of the most influential people in the world and was voted the 3rd greatest stand-up comic in the Channel 4's 100 Greatest Stand-Ups. The US President has repealed Obama's law and is once again allowing elephant trophies to be imported from two African countries. The second annual Wetnose Day has celebrity backing as it encourages animal lovers to “pose with a nose”.